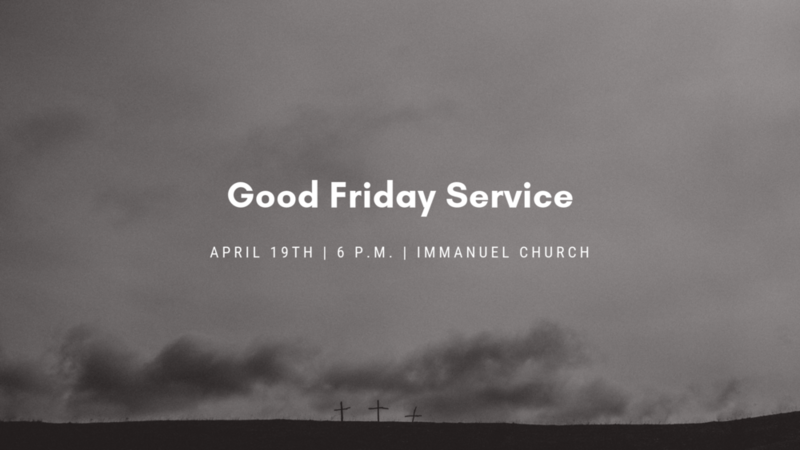 On April 19th at 6 p.m., we will have a Good Friday service in remembrance of the blood Jesus shed on the cross in our place. Join us as we remember, as we appreciate, and as we look forward to His resurrection and conquering over sin and death. Each year we hold a training for several hours to go over policies, procedures, and more for our Immanuel Kids volunteers. If you did not attend the training in 2018 or you are new to the Immanuel Kids Serve Team (since the last training in 2018), attendance in mandatory. Childcare will be provided. If for some reason you are not able to attend, please email Heather Hancock at your earliest convenience. On March 30th we will have a discipleship workshop centered around prayer. In this time together, we will not only learn more about how to pray, but we will be praying for each other, our church, our city, our nation, and our world. This is a time to come learn and experience what it means to zealously pray. Be sure to sign up if you plan to attend. In 2019, Immanuel Church began a partnership through World Orphans with Wolisso Berhane Wongel Church in Ethiopia. Tentatively, we have scheduled trip for November 2nd-11th to serve alongside our church partners in Ethiopia. If you are interested in learning more about this opportunity, please plan to come to this interest meeting on March 17th at 5:45 p.m. at Revelator Coffee in Mountain Brook. Children are a gift from God. When we dedicate a child to the Lord, we are acknowledging that ultimately, every child belongs to Him. Parents who have been entrusted with a child are to care for them, love them, and raise them up to know and love Jesus. In dedication, parents commit to nurture and disciple their child in the fear and admonition of the Lord. Child dedication is also a beautiful picture of community, where the congregation celebrates new life with parents and encourages parents to raise their children to follow the Lord. The congregation commits to serve parents by caring for and teaching children the gospel alongside parents. If you would like to dedicate your child, reserve a spot via the registration below. If you have any questions, please contact connect@immanuelbirmingham.com. At our last member meeting on February 17th, Greyson Campbell was voted to become a elder of Immanuel Church. On March 10th at 6 p.m., we will have an ordination service for Greyson. Please plan to join us for this celebration alongside the Campbell family. Our first ever Immanuel Men's Retreat will take place on March 8th and 9th. We'll meet at Codie Gibbons’s house on Friday night from 7 p.m. - 9 p.m. for some delicious food from none other than James Fuqua. Then Saturday morning we'll meet at Oak Mountain State Park at 9 a.m. for a hike and outdoor fellowship. The cost for Friday night is $15 and then it's $5 per person to get into Oak Mountain State Park. This year we will have an Ash Wednesday Service as a time to begin the Lenten Season. Join us on March 6th at 5:30 p.m. Childcare will be provided from children ages birth to age five. Before a family goes through the process of child dedication, we we be hosting a prerequisite meeting. If you plan to dedicate your child on March 17th, this meeting will be required. Lunch will be provided to everyone who attends. If you’d like to sign up for child dedication, click here. Immanuel 101 is a concentrated time to learn about Immanuel Church's mission, vision, and beliefs. Anyone who is interested in becoming a covenant member of Immanuel must attend and complete Immanuel 101. Join us on March 2nd from 9 a.m. - 12 p.m. for the Immanuel 101 course this spring. Please be sure to sign up if you plan to come! If you will need childcare, be sure to indicate it. Join us on February 17th at 6 p.m. for our quarterly Member Meeting. Child care will be provided for all ages. If you're new to Immanuel, join us for coffee and dessert on February 10th at 6:00 p.m. for a casual gathering and dessert and coffee with several Immanuel members. Location TBD. Join us on February 9th for a time of cleaning up, cleaning out, and doing some work around the church space. If you would like more information about how to get involved or how to sign up, click here. This will be a time to gather together in corporate prayer, share what God has been doing in and through our lives, and worship alongside one another. Taking time for corporate prayer is so vital to our church mission and vision, and we ask that you make it a priority to come. We'd also love for you to participate, and ask that this week you ask the Holy Spirit to make you sensitive to His voice as you spend time in His Word. We will begin at 6:00 p.m. and will end by 7:30 p.m. Child care will be provided for children of all ages. On Christmas Eve, we are joining our friends at Birmingham Community Church for a Christmas Eve candlelight service. If you are in town, this will be a special time to worship our Savior. Please join us Monday, 5:30 p.m. at 600 Riverchase Pkwy W, Birmingham, AL 35244. Delicious food. Festive Fun. Ornament Swap. Fellowship with Friends. Mark your calendar because we’ll have our annual Immanuel Ladies Christmas Party on Monday, December 17th at 6:30 p.m. at the church. We will have some yummy food and goodies, and we will also have an ornament swap. Bring an ornament to participate and you'll go home with one too. Be sure to invite your friends! Join Immanuel Kids for a party to celebrate Jesus’s birthday! We’ll have cupcakes and Christmas activities for children of all ages. This event will take place on December 16th from 4 p.m. - 6 p.m. Calling all college and grad students! Come to Immanuel Church December 9th and 10th from 7 p.m. - 11 p.m. (or anytime in between) to eat your heart’s desire of delicious pancakes and grab some coffee! Can’t take a break? Bring your books and laptop and we’ll have our wifi available for you to study while you’re there! Ring in the holiday season at Christmas in the Park. This year we’ll transform our park(ing lot) into a fun and inviting space full of seasonal favorites. From hot chocolate to live music, you won’t want to miss this evening. And don’t forget to invite your friends and neighbors! Join us on November 14th at 6 p.m. for our quarterly Member Meeting. Please make every effort to be there as we’ll be discussing the 2019 budget. Child care will be provided for all ages. Cooler weather means lots of things, but for Immanuel Ladies it means it’s time for our annual retreat!! Join us on November 9th-11th on Lake Martin for a time of rest and rejuvenation. Invite your friends and bring your family to Family Fun Night at Immanuel Church on October 21st at 5 p.m. We’ll have lots of outdoor games for kids and adults, music, and best of all — a chili cookoff between GCs (don’t worry, we’ll have non-biased, independent judges)! Dust off your lawn chair and crockpot and be sure to attend and participate! Immanuel 101 is a concentrated time to learn about Immanuel Church's mission, vision, and beliefs. Anyone who is interested in becoming a covenant member of Immanuel must attend and complete Immanuel 101. Join us on October 6th from 8:30 a.m. - 11:30 a.m. for the Immanuel 101 course this fall. We will begin at 6:00 p.m. and will end by 7:30 p.m. Child care will be provided. Join us for Kid's Discipleship Class each Sunday for kids ages 1st grade and up at 9:00 a.m. If you're new to Immanuel, join us for coffee and dessert on September 16th at 6:00 p.m. at The Adkison's home. Join Andy and Melanie, as well as several other members for a casual gathering and dessert and coffee. Join us on September 9th for our quarterly Member Meeting at 6:00 p.m. Child care will be provided. 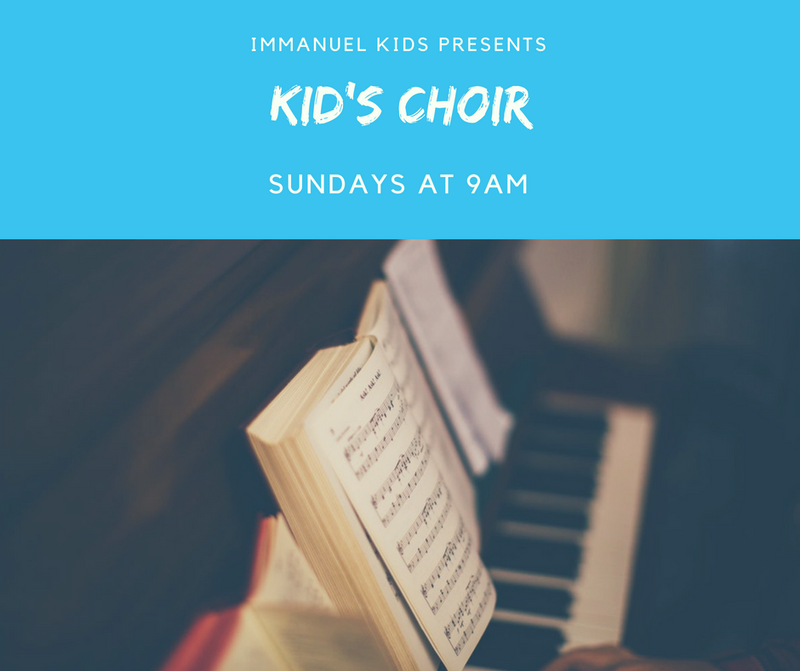 Kid's Choir will be meeting on Sundays from July 15th-September 2nd at 9:00 a.m. before worship. Kids ages 1st grade and older are invited to attend. Join us on August 26th at 6:00 p.m. for our annual Community Life Kickoff Fellowship as we get ready to launch our fall semester of Gospel Communities at Immanuel. Bring yourself and the family for a potluck style dinner and short program to get to know our GC leaders, hear updates about GCs at Immanuel, and meet some new folks! Be sure to SIGN UP and we can't wait to see you on the 26th!